You can hire Lady Daphne exclusively for your event. Come and celebrate the present with a beautiful host from the past…. 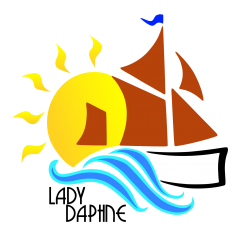 We can accommodate groups of all sizes, large or small (maximum 50 sailing). 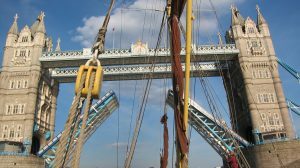 We will arrange for Tower Bridge to be raised especially for your event as we travel along the Thames. Celebrate a birthday, special anniversary with friends and family onboard. 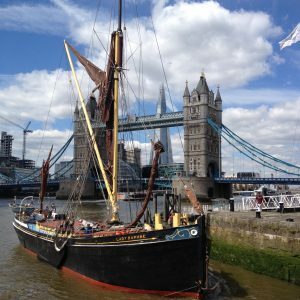 Host a dinner, cocktail or drinks party whilst sailing past the London skyline. 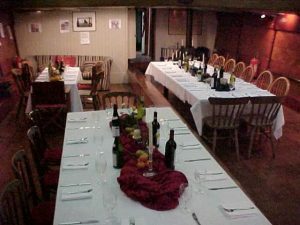 Hold a wedding reception, a graduation celebration or a celebration of someones life in the unusual and charming surroundings of our old Lady. So if you are looking for something different for a special celebration give us a call. 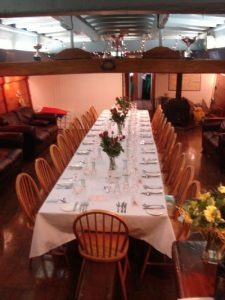 Packages will be bespoke to your needs, from the sailing through to the catering and interior layout…. 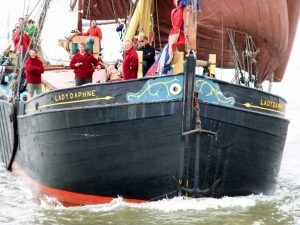 Typically a full day sail on Lady Daphne will cost around £2500 , which equates to £50 per person for a full capacity passenger quota. Catering and drinks/bar facilities are additional to this and can be discussed to work within your specific requirements and budget. 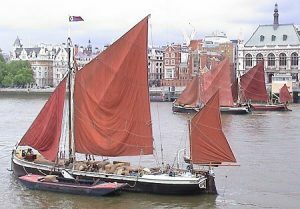 We can also offer part day or small group cruises, which may be discounted depending on circumstances, e.g. off season hire. Please feel free to contact us for a specific quote to suit your budget.